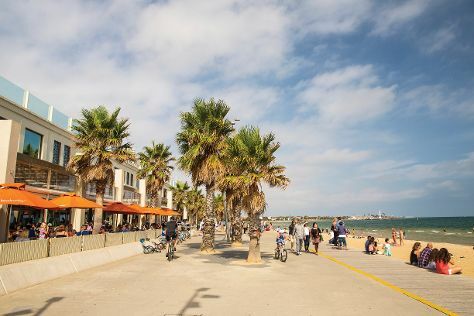 Your itinerary includes some good beach time at St. Kilda Beach and Eastern Beach Reserve. Satisfy your inner culture vulture at Melbourne Museum and National Gallery of Victoria. Explore Melbourne's surroundings by going to Moonlit Sanctuary Wildlife Conservation Park (in Pearcedale), Devilbend Natural Features Reserve (in Moorooduc) and The Great Ocean Road (in Torquay). Spend the 9th (Tue) wandering through the wild on a nature and wildlife tour. Dedicate the 24th (Wed) to wine at some of the top wineries in the area. There's lots more to do: look for all kinds of wild species at Trin Warren Tam-boore, take in nature's colorful creations at Melbourne Zoo, enjoy breathtaking views from Eureka Skydeck 88, and contemplate the long history of Sovereign Hill. To see ratings, maps, traveler tips, and more tourist information, refer to the Melbourne trip itinerary website . If you are flying in from Germany, the closest major airport is Melbourne International Airport. In April, daytime highs in Melbourne are 23°C, while nighttime lows are 11°C. Finish your sightseeing early on the 25th (Thu) to allow enough time to travel back home.